There is a tradition in my family of the Advent Calendar. Opening a little gift or candy each day of December leading up to Christmas Eve. There is something wonderful about creating a sense of anticipation, it’s like an easy scavenger hunt with a fantastic ending. Here at the Urban Yarns blog we will be posting something new every day leading up to Christmas so I hope you enjoy! First up is a pattern that is so very popular on Ravelry at the moment, the ‘Gaptastic’ cowl. 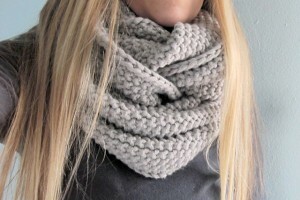 It’s knit in Bulky yarn and takes only 280 meters. It’s the perfect quick knit gift! It would look great in any of our bulky yarns, Spud and Chloe Outer, Classic Elite Twinkle, Cascade Eco Plus or Blue Sky Alpacas Bulky (among others). The weather is turning chilly so you can head out to a local mountain in your own cozy wrapping cowl. This entry was posted on Thursday, December 1st, 2011 at 8:05 pm	and is filed under Uncategorized. You can follow any responses to this entry through the RSS 2.0 feed. Both comments and pings are currently closed.